Oliver here. I’m doing the fill ins this week and I hope you like my answers. You can join this blog hop by going to visit one of the hosts, our furiends 15andmeowing or the good folks at our-Legged Furballs. You’re always welcome to opine about your answers in the “opining” section (comments) of this blog post. 2. My favorite 4th of July picnic food is _____________________. 3. I begin every day with _________. 4. _________ is the best thing since sliced bread. 1. Fireworks are a tool of the devil. Neither I nor any of the Tribe of Five like them. I run and hide when I hear them. 2. My favorite 4th of July picnic food is anything with beef in it; hamburger, hot dogs, you name it, I love beef and I rarely get any people food but it doesn’t stop me from hanging around when the Male Human is cooking meat on the upstairs grill. Note that I am presenting my cutest begging pose while keeping a close eye on the Male Human while he cooks. 3. I begin every day with a little bonding time with the Humans. They always say good morning, feed us our soft food breakfast and give us attention before they leave for that place they call “work”. I have no idea what that place is and we felines do not have the word “work” in our vocabulary. 4. Celebrating our country’s birthday is the best thing since sliced bread. I am quite a purratriotic feline and even ran for Purresident! You can read about it on our website. Will I run again in 2020? Only time will tell. A few weeks ago The Female Human went to the Cat Writer’s Association conference and we graciously allowed the Male Human to accompany her. The deal was, they would bring home our prize if we won and she’d learn how to be a better assistant to the Tribe. Imagine my dismay when I found out that the trip wasn’t always work. I am beside myself. Tell me what you think about this betrayal. It’s that time again for me to sniff out some of the less publicized and more interesting feline related postings on the information highway. IO hope you enjoy this week’s finds. I love stories about the creativity of humans when it comes to shelter kitties. This was a new one and it’s great. The good folks at the SPCA of Florida discovered that a warm laptop and the glow of the screen captivates felines. They decided they’d play kitten friendly videos on laptops and the results were purrfect. The kittens watch videos like “Barnyard Buffet” where mice run through pieces of cheese, birds flutter by and bugs are all over the screen. The kittens are reacting with the videos and their environment is enriched greatly. Human experts say that the visual stimulation is good for the cats and that they love the computers because they are a nice place to snuggle and warm up. When Oliver and I were kittens, we had an iPad mini to play with and we loved the Friskies app Jitterbug. Maybe you humans should start donating your old laptops to your local shelter. Photographer Andrew Marttila is a photographer famous for capturing the awesomeness of us felines. His latest project is “Cats on Catnip,” which allows you humans in to the realm of feline nip addiction. Now I realize I said earlier that I am a feline of moderation but I forgot to mention that does not include catnip! Each member of The Tribe of Five has a different reaction to nip but we all agree, Tucker can be a mean drunk! So can we put this ridiculous argument to rest finally? Cats are good for your health humans. My Humans think insurance companies should offer a discount for those who live with felines. I’m sharing this ad from our local Panhandle Animal Shelter. All of The Tribe of Five were adopted and Oliver, Lily and I came from Panhandle Animal shelter. Please consider giving a feline a furever home this month. If you’re in doubt, just ask our Humans. They love their furry family! I’m sharing pics from our feline family album. Now go adopt a cat! Alberto: “Lily do you see any suspicious activities? Alberto: “So if we do see a bear or a bad guy, what are we supposed to do? Lily: “Hmm, good question. Without opposable thumbs we can’t call the police. Oliver here. I’m taking the Fill Ins this week. It’s really fun and I encourage you to purrticipate. 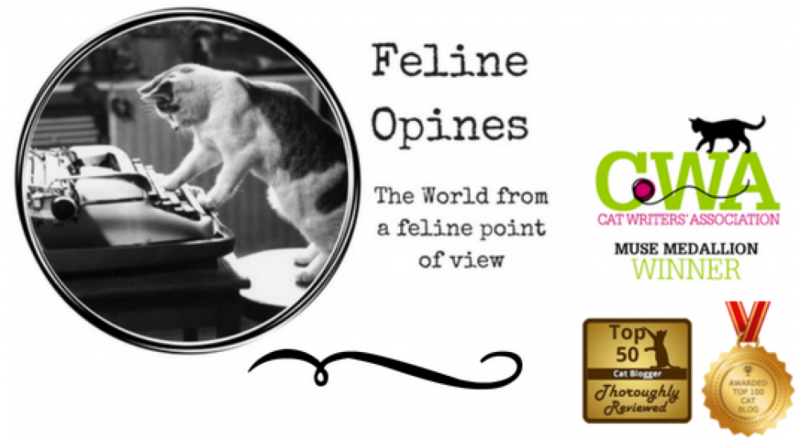 Just head on over to our friends 15andmeowing or their co hosts Four-Legged Furballs and enter the blog hop. You are always welcome to opine about your fill in answers in the comments of my post too. I hope you enjoy my answers. 1. My favorite scent is fresh box. Ah, there’s nothing like it! 2. I hope to spend some quality time sunning on the upstairs deck this weekend. 3. The sound of a cat food can opening is music to my ears. Hey, is that the stinky sardine stuff I like? 4. Home is where all my toys are. Oh good grief. Evidently someone gave the Female Human the opportunity to talk about Feline Opines, the Home to Home program and other stuff. Seriously??! If you want to hear the Female Human opine on the Humarian podcast, here’s the link (although The Tribe of Five is far more entertaining. The Female Human Opines on the Humarian podcast. Well hello there my furiends! It’s Wednesday again and time for me to bring you the internet gems I’ve discovered. I hope you enjoy this week’s web wanderings. Those of you who follow my Wednesday posts know that I’m a sucker for a working cat story. This is one with a bit of a twist. Instead of a shelter looking to find “jobs” for their felines, a company has taken the feral cat issue into their own paws. There are hundreds of cats there but all are treated with love and care. This is a win-win situation for humans and felines. The cats are well fed, taken to the vet when needed and the shipyard has no rat problem. The shipyard has one person who oversees all the cats and they also use the Trap Neuter Release (TNR) method as a human way to control the population. In the event kittens do make an appearance, they have fosters on standby who prepare the kittens for adoption. The shipyard has their own adoption program. Now if only more businesses would partner with feral cats and take care of them like the good humans in this shipyard it would be a wonderful thing. The Tribe of Five is so impressed with the work these humans we are giving them our “Paws Up” award. So many times when our Humans come home from a trip, the first thing they ask is, “Did you miss us?” Well of course we did but we felines often get a bad wrap regarding our emotional attachment to our humans. Well our furiend Yuuki has provided video evidence of the human/feline bond. She often meows and stares at the photo of Max, who left seven months ago for the navy. Yuuki has lived with the family for about a year and is named after Max’s favorite musician. Yuuki will be one happy cat as Max’s mom has a one day visit with her son and she’s taking Yuuki with her. Humans. never underestimate our love for you. In last week’s Walk Through the Web Wednesday, I reported on the Russian cat Achilles was chosen to predict the winner of the World Cup matches. Well now he’s being called the “Psychic Achilles” because he predicted Russia would win…and they did! And if you’re thinking this was a lucky one-off for Achilles, this isn’t his first rodeo. He correctly predicted the outcomes of three out of four Confederations Cup matches played in St. Petersburg last year, including the opening and final matches, according to Tass. Evidently the human who wrote this finds it amusing that her mother leaves a bio for the pet sitter. I was a bit incensed at the frivolity with which this writer approached the issue of cat bios for the cat sitter. IMHO this should be something every human does for their felines. Our Humans have a 7-page booklet for our cat sitter (it’s updated regularly and it includes photos). I have included the first section of our cat sitter bio. This is another “Bravo Humans” report. Stray cats of south Korea have received little attention or support and the number of homeless felines continues to rise to unprecedented proportions. This sad situation prompted a national petshop chain ‘Molly’s Petshop’ to design a collaboration to bring an affordable, eco-friendly solution to cats in need in the winter. Local Good Will and other thrift stores collected hoods and other padded clothing and these items were then turned into amazing cozy homes complete with roofs, beds, bowls for water and food and finally, a weather proof, tent shaped cover. Molly Customers received these Hood Homes and they distributed them in their local feral colonies. Molly’s pet shop/e-mart saw a 1,254% increase in sales for stray cat food awareness of the plight of strays was raised to over one million people in just two weeks time, and most importantly, over 2,000 stray cats were provided with a warm shelter, food and water, during the middle of December, in Seoul. So Humans who’s going to take on this project in your area? We had to give the good people of Molly’s Pet Shop, their customers and all those who helped collect items and design these warm feline lodgings a Paws Up Award!